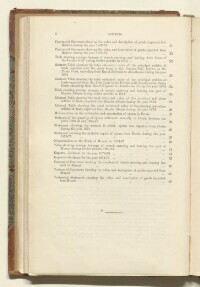 The record is made up of 23 folios. It was created in 1875. It was written in English. The original is part of the British Library: India Office The department of the British Government to which the Government of India reported between 1858 and 1947. The successor to the Court of Directors. Records and Private Papers. 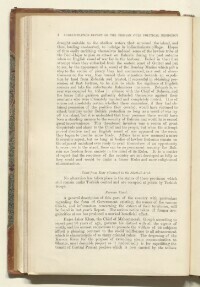 Annual Report on the Administration of the Persian Gulf Historically used by the British to refer to the sea area between the Arabian Peninsula and Iran. Often referred to as The Gulf or the Arabian Gulf. Political Residency A diplomatic office of the British Government established in the provinces and regions considered part of, or under the influence of, British India. 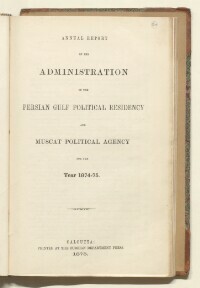 and Muscat Political Agency An office of the British Government and, earlier, of the East India Company. for the Year 1874-75 , printed at the Foreign Department Press, Calcutta, 1875. A memorandum on the trade of Muscat, with six accompanying tables of trade statistics and data, written by Lieutenant-Colonel Samuel Miles Barrett, Political Agent A mid-ranking political representative (equivalent to a Consul) from the diplomatic corps of the Government of India or one of its subordinate provincial governments, in charge of a Political Agency. and Consul at Muscat (folios 63-69). 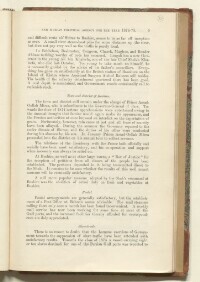 The report is arranged in sub-sections, those relating to the Bushire Residency A diplomatic office of the British Government established in the provinces and regions considered part of, or under the influence of, British India. appearing first, those related to the Political Agency An office of the British Government and, earlier, of the East India Company. 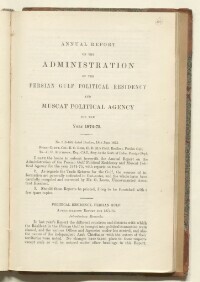 at Muscat appearing second. 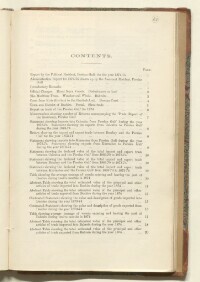 There is a table of contents (folio 48) that gives page references.